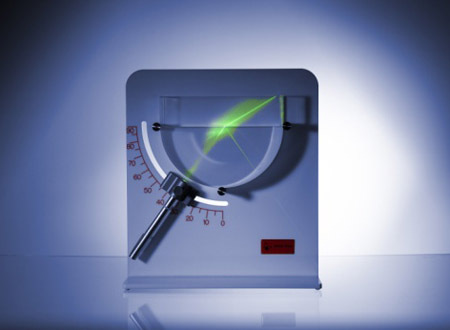 Using the Refractometer Teaching Model it is easy to explain the measurement of the refractive index of liquids via the critical angle of total reflection. The same measuring principle is used in modern digital refractometers. Both refraction and also partial and total reflection can be observed. With the teaching model the differences in the refractive index of different liquids can be determined in an illustrative and practically relevant way. Water and solutions of household sugar are suitable samples. The Refractometer Teaching Model is a useful and attractive complement to specialist books and is frequently used at universities and colleges. A laser pointer with a light wavelength of 532 nm is included in the delivery.